When Brenda Ehrmantraut found out that her brother, a member of the National Guard, would be deployed to Iraq for a year, she knew his departure would have a huge impact on her two young nephews. While the community rallied around the troops and prepared to say goodbye, Brenda had a strong urge to do something significant, too. “I lived in the community where his National Guard Unit drilled, so many of the people in our community were saying a year-long goodbye to a loved one,” she explains. Knowing how strong the bonds between parents and children are and how stretched and strained communication can quickly become for parents overseas, Brenda decided to write a children’s book that would help ease the stress that military families were feeling. 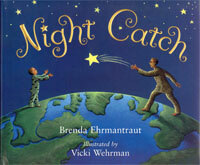 Brenda’s book, Night Catch, published in 2005, is an illustrated children’s book that plays off the traditional game of catch. The book traces the story of a soldier who receives an overseas assignment and must leave his family. To help his young son through the transition, he promises to play a nightly game of catch using the North Star. He tells his son if he takes a deep breath and blows hard enough, he’ll send the North Star flying through the sky each night, reaching the father in time for him to send it sailing right back. “I was overwhelmed with thoughts of how it would feel to leave my own children for a year. My brother is an amazing dad, and I knew being away from his boys for a year would be a disappointment,” says Brenda. Night Catch reinforces the strong connection that remains between parents and children, even when there are oceans, mountains, or deserts in between. While the book addresses the absence of a loved one, it also piques interest in the constellations. The mix of comforting story and look to the stars has attracted larger organizations and entire communities to its poignant message. Military Child Education Coalition, a national nonprofit supporting military students, adopted the book for its school and parent programs, using the story as a way to help children talk about their feelings. Silicon Valley Reads, a community-wide reading program in California, chose Night Catch as its 2013 children’s book selection for young readers. The book also caught the attention of Scott Sumner, Fred Chavez, and Cliff Bailey, the ambitious team behind the Mayborn Science Theater. The team created an animated full-dome video production of Night Catch and premiered the film in their planetarium on the theater’s 10th anniversary. Turning Night Catch from a book into a film was no small feat, considering Scott, Fred, and Cliff are the only full-time employees at the planetarium. They work year round scheduling field trips with local schools and running programs for the community. The planetarium is located in Killeen, Texas, home to Fort Hood—the largest military base in the world, making their first production significant for the entire community. The planetarium shows the film in its full-dome theater, an impressive 360-degree perforated aluminum dome that stretches 60 feet in diameter. “It’s not just a mere video where you see only what’s in front of you,” explains Clifford. Children inside the theater are immersed in the graphics, which mirror the book’s illustrations by Vicki Wehrman. The planetarium schedules special showings of Night Catch during the week, to accommodate numerous field trips from local schools, and has regular showings for the community on weekends. At the conclusion of each film, an instructor illuminates the dome with images of the night sky and takes children on a virtual tour of the stars and constellations. While the film is geared mainly toward children in second grade, Cliff says that children of all ages relate to the film, especially if they have a deployed parent. “Kids are our bread and butter, so we’re doing our best to help them through this transition,” says Cliff. Brenda, too, has had many memorable experiences with her readers. She frequently visits schools to chat with students and teachers about the themes in Night Catch, specifically the prevalent themes of connection and comfort. Brenda recalls her most touching encounter with a reader. A young boy, whose parent was deployed overseas, carried a copy of Night Catch in his back pack every day. “He was having a rough time with the separation,” she says. “If he was having a bad day, his teacher would say ‘Let’s get your book out and read it together.’” The act of reading the story together immediately helped the boy refocus, says Brenda. Through this imaginative game of catch with Polaris, children are reminded of the powerful message that they can stay connected to a loved one despite the distance. Illustrations courtesy of Elva Resa Publishing. 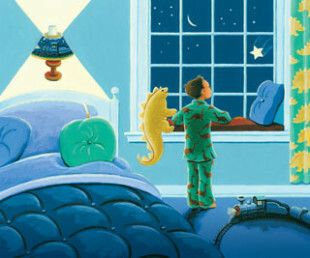 This spring, Night Catch was acquired by Elva Resa, the leading US publisher of books for and about military families. The paperback version releases July 15, 2014. Erin Simpson is a frequent contributor to Books Make a Difference. When she is not writing, reading, or climbing the corporate ladder at her publishing job, you can find her scouring her Brooklyn neighborhood for good food and unique finds.